This is plated with an anti-corrosive finish, Commercial Grade and Quality. Simply screw-on this adapter to any fitted male F connector end of a coxial drop cable, thus making a transitional lead to other equipment. 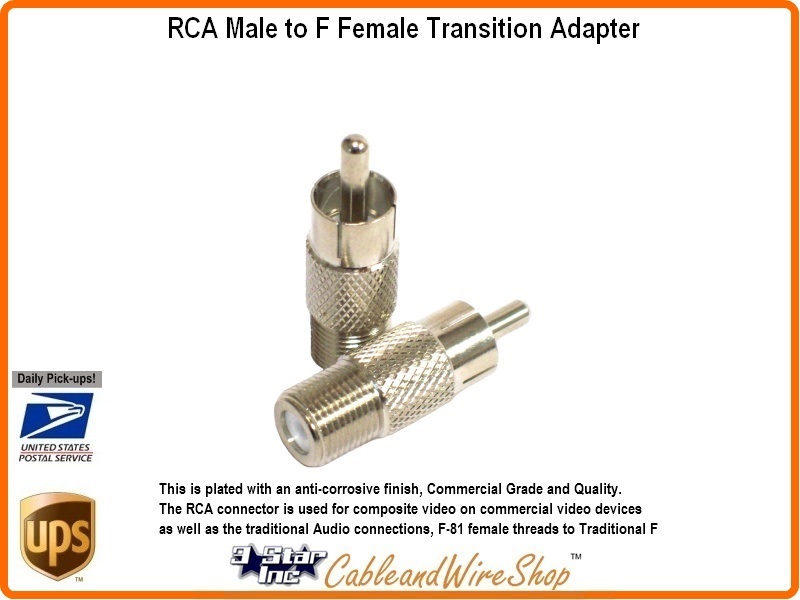 The RCA connector is used for composite video on commercial video devices as well as the traditional Audio connections most are used to seeing, although many consumer electronics devices with RCA Video jacks can be used with BNC-only commercial video equipment via a simple adapter. The F connector is a type of coaxial RF connector commonly used for "over the air" terrestrial television, cable television and universally for satellite television and cable modems, usually with RG6/U cable or, in older installations, with RG59/U cable, but is also used for transport of IF (Intermediate Frequencies) between pieces of equipment. Note: Technicians will use this transition in custom lengths of RG6, RG59 or miniax to inteconnect Audio and Video between pieces of equipment as most RG jumper ends are terminated in F connectors and most Video and Audio has RCA Bulkhead connectors protruding from the back of equipment.